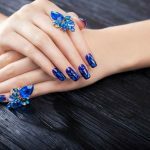 Diamonds are a girl’s best friend, and even though most of us can not afford diamond rings or statement necklaces, we can definitely add a few diamonds to our nail art designs! Whether you want to create something really unique for a special occasion or would like to experiment with a shiny new manicure, diamonds are here to stay. The idea of a nail design with diamonds may seem complicated or expensive, but these days anyone can give them a try. 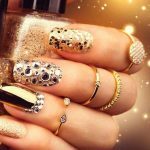 Although the impractical option of sticking real diamonds on your nails is available, there are plenty of cheaper options too. Incredibly realistic faux diamonds, and other gemstones, can be purchased easily and cheaply. Designed specifically for nail art, they are conveniently flat backed to aid adhesion. There are also some great nail stickers that mimic the effects, but in a more practical way than the full on 3D finish. You can opt to go all out and coat your entire nails in diamonds or go for a simpler accent look on one or two fingers. Customization options are endless, so don’t feel limited to a single color, shape or size of diamond either because variety can contribute create different looks. A dramatic look can be achieved by using a dark base polish, and applying a curling line of decreasingly sized gems from base to tip of one nail, or if you fancy cute and girly, try adding diamonds to a base of baby pink. There are several ways to apply your sparkles. Using polish to stick your gems into works as a short term solution, but using resin or adhesive is a much better option for longevity. However, I’ve found the best way is to use gel. This method is strong enough to hold even the largest gems, and since gel doesn’t harm glass or synthetic crystal, the gems can be soaked off and saved for next time. With no special surface prep required, simply apply gel and crystals directly over the cured color or set acrylic. Couldn’t be simpler! I couldn’t resist trying out the best selling diamond nails on the market – all in the name of research, of course! This boxed set of flat-backed rhinestones contains so many variations in size, shape and color that you can create any nail design using it. The crystals are great quality, very clear and stick nicely. The box can be a little hard to open, so be careful not to throw them everywhere! For sparkle, and sheer amount of crystals, this is a really useful set if you’re a fan of 3D nail art. 1. Total 4600pcs in Box 8 Sizes SS3 SS6 SS8 SS10 SS12 SS16 SS20 SS30, 1.3mm-6mm Nail Rhinestones in Case Super Sparkle. We Only Supply High Quality Nail Rhinestones Crystals, Sparkling AB Rhinestones for Nail Art, DIY Crafts Decoration. Coming as a fine powder, these diamond chips can be easily brushed onto your nails, and coated with several layers of top coat for a glamorous luxury look. I love this stuff and will be using it many times. Inevitably, as they are sent out in a small sealed bag, some of the dust gets stuck in the bag. A tub would be a great solution to this. For sheer indulgence and sparkle, this pack is well worth considering. ✔️ IMPOSSIBLY TINY SIZE-- 1.2mm in diameter, easy to apply on the nails, simply spread them on the nail as you wish and softly push to secure them, no need to apply one by one. These little charms are simply gorgeous. Beautifully designed, they’d make any nails look chic and stylish. The stick well, and stay in place nicely. The bag is way too small – I must have more of these! If your goal is to create beautifully unique 3D nail art - you need these! These pretty multi faceted crystals are ideal to create unusual designs, especially on longer nails. The crystals are clear and colored, giving you a lovely variety to choose from, and extremely sparkly, thanks to the gold backing on the stones. Until they settle into the glue, these crystals can seem a bit unlevel, but once the adhesive has worked, they’re just fine. Bringing ultra sparkles to any nail art, these are well worth considering for your manicure kit. ☂️ GOLD-PLATED BACK&LONG LASTING SHINE GLASS CRYSTAL - These Flatback Rhinestones Is Gold Coated, The Material On Top Is Premium Made Glass Crystal, Which Helps To Enhance The Shine And Long Lasting Of The Color. Looking identical to genuine diamonds, these mini chips sparkle and dance on your nails. Either dip your nails into the pot, or place each gem individually, they look amazing. I had compliments every time I wore these out, and now have to have them in my manicure kit at all times. A couple of the gems had rough edges, but with so many in the pack, I didn’t feel this was an issue. These could easily be mistaken for the real thing, and bring more than a touch of bling to any design.